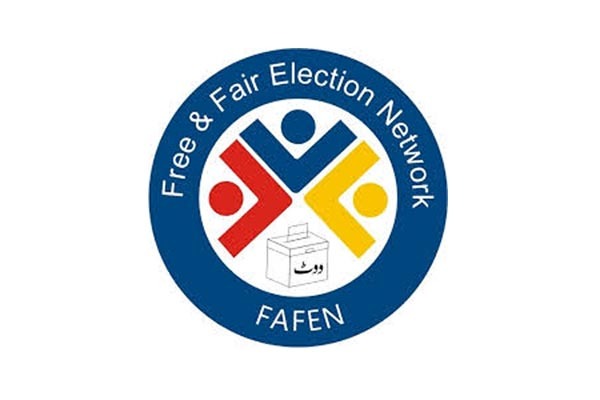 ISLAMABAD, Jul 18 (APP):Free and Fair Election Network (FAFEN) will monitor the election process in 85 per cent of total polling stations to be set up by the Election Commission of Pakistan (ECP) for July 25 elections. “The observers will visit as many as 76,000 polling stations out of 85,000 polling stations, all the observer had been issued accreditation cards by the Election Commission of Pakistan and the preliminary report will be issued on July 27” he added. He said that as per Code of Condcut of ECP, FAFEN observer will be allowed to visit the polling stations three to four time and “We hope all will be good and observers will be allowed to monitor the process as per the agreement reached between ECP and us”. He said that 9,884 observers in Punjab, 4,225 in Sindh, 3,549 in Khyber-Pakhtunkhwa, 1,117 in Balochistan and 225 in the Islamabad Capital Territory will be given a task to monitor the process. He said the accredited non-partisan and trained citizens will observe the Election Day environment including incidents of electoral and political violence and pre-balloting preparations at the polling stations. Furthermore, they will also look into the voting processes inside the polling booths and stations, ballot, vote -counting and ECP forms-filling processes at the polling stations and the barriers to women voting. Fafen will also observe the vote consolidation process at the offices of Returning Officers (ROs), he added. To a question he said the FEAFEE will issue monitoring report of election campaign within few days.